The Premier Trials Club of the Central U.S.
Come and Ride a TI Event! 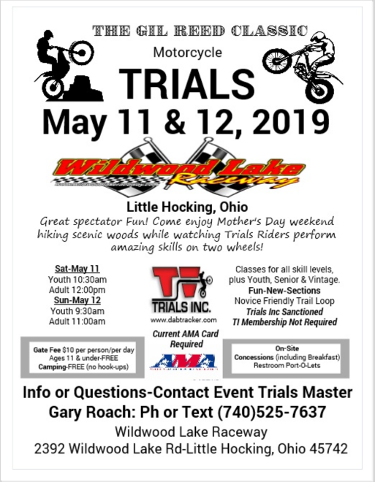 The event at Wildwood in Little Hocking, OH has been moved from May 18/19 to May 11/12 due to a conflict with the GNCC schedule. 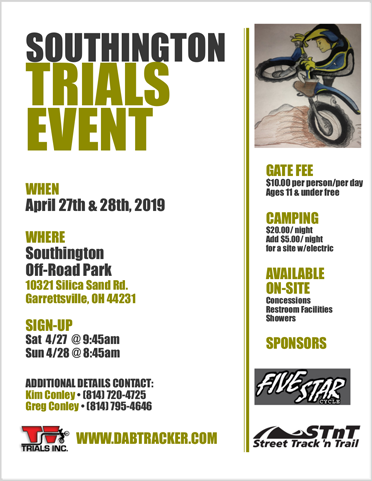 The event at Crosswinds in Sidell, IL has been moved from May 4/5 to August 10/11 in order to remove the back to back event conflict with Southington. The HOF page for our 2018 inductee, Dennis Ziolkowski, is live. Dennis has been a big part of TI for many years and we're very excited to add his name to the TI Hall of Fame for 2018! TI will donate $500 to the TDN. In addition, we will be doing various fundraisers throughout the year. TI will donate $1000 to our TI Youth Fund. In addition, TI is selling shirts, hoodies and various other items with proceeds going to the Youth Fund. Gate Fees have been standardized across all TI events. It will be $10.00 for 12/up. 11/under will be free. Camping fees can vary by venue. Vintage Cup will be in Taylorsville, KY this year on Oct 12/13. Open Class Rule Clairification: Made the rule more clear that a rider must declare which line they will be riding at the start of each section. They may choose a different line on each ride of the section. Champ Class - It was decided to pull back the level of difficulty of the Champ class. It's currently at a nearly NATC Pro level. It needs to be closer to a NATC EX / EX-SP level. We are trying to compile a list of all the Bill Spring Award winners. If you've won the award or have any part of a list of those who have, please contact us via the contact page. Your Chance to be in the Spotlight! 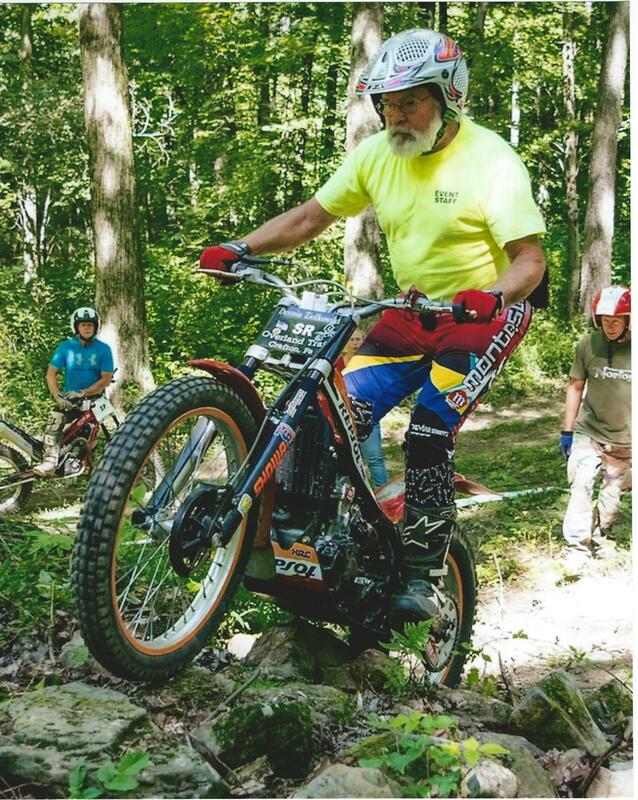 Trials Incorporated prides itself as being a tight-knit community, one big motorcycle-loving family, who helps each other through the challenges and cheers through the successes. We would like to honor our members by offering them the chance to step up and be recognized for their incredible talent. 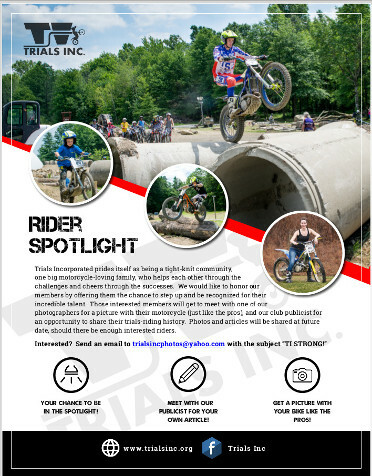 Those interested members will get to meet with one of our photographers for a picture with their motorcycle (just like the pros), and our club publicist for an opportunity to share their trials-riding history. Photos and articles will be shared at future date, should there be enough interested riders. Interested? 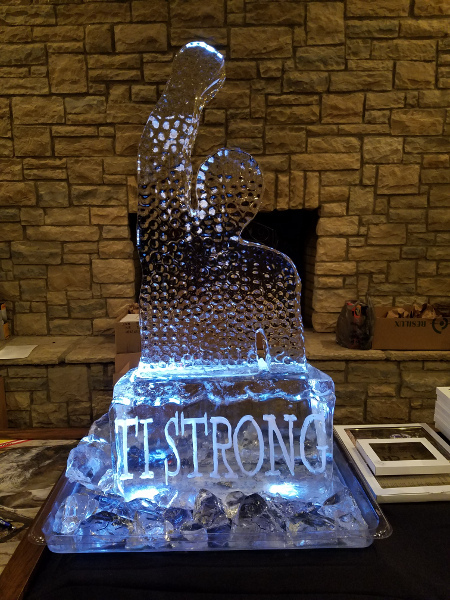 Send an email to trialsincphotos@yahoo.com with the subject "TI STRONG!"